Take a walk through the Charpentier Historic District of Calcasieu Parish in Lake Charles, and you might notice something a bit unusual. Unlike in some historic neighborhoods found around the United States, the houses here don’t necessarily have uniform fencing or the same kind of vegetation. They aren’t all the same size or height. The houses aren’t all the same color. In Lake Charles, it isn’t any sort of unity that makes the historic district unusual but rather a shared past that has resulted in a neighborhood featuring an eclectic collection of Victorian-style buildings, each with a distinct story and unique look. Massive columns are combined with wood-crafted ornamentation. Turrets are decorated with stained-glass windows. Intricate balustrades, scrolls and spindles detail expansive porches. Originally a lumber town with 28 sawmills, Lake Charles was a place made out of wood. The term “Victorian” is used to represent many styles of architecture that evolved in England and the United States from around 1840 to the early 1900s, but the city’s unique position as a lumber town resulted in immediate access to unusual tools, putting an uncommon spin on a common form of architecture. “When you come to Lake Charles, you’ll see Victorian architecture that has some distinctive Lake Charles features,” says Adley Cormier, long-standing advocacy chair of the Calcasieu Historic Preservation Society, which helps identify and document historic structures in the area and assists homeowners and property owners in maintaining these buildings. Design styles ranging from Queen Anne revival, the most elaborate of Victorian styles, to bungalows, which have large, overhanging roofs, can be found throughout the area. Gothic revival, colonial revival, Italian renaissance, Spanish colonial, Byzantine, Hollywood Moorish, Scottish baronial, Southern Greek revival and neoclassical French architectural styles are all found tucked down the neighborhood streets in this unsuspecting Southwest Louisiana town. Because of its history as a lumber town, many distinctive architectural features were born in Lake Charles, including a particular siding design known locally as German siding, which was created from the Louisiana cypress tree. The Lake Charles column first appeared after the turn of the 20th century when these two-story, slightly tapered columns made out of a single board came into use, and there are several great examples of the feature today. “This is essentially the sawmill version of the Greek revival column,” Cormier says. Another home that Bourdier finds particularly attractive is a large two-story colonial building that was built in 1904 or 1905 and had many owners before being left vacant for several years. It was then bought by an attorney who did an excellent job in restoring it. “I always point it out to all the people I take on tour because it’s the epitome of Lake Charles colonial architecture,” he says. 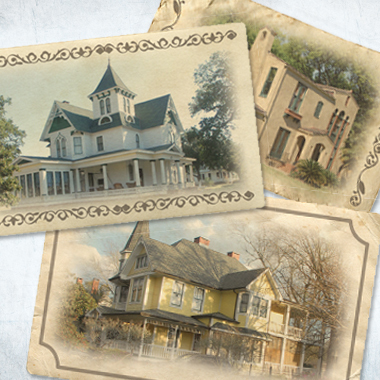 It has a grooved ceiling on the porch painted blue and the famous Lake Charles columns. Although the buildings themselves are the primary draw to the historic district, the people who have lived and worked here also left a legacy. “You can’t have a tour without ghosts,” Bourdier says. The first anesthesiologist in Lake Charles (who also conducted one of the first dairy inspections) lived in a house on the corner of Kirby and Reid streets – and he may still live there today in ghost form. A house on Mill Street is said to be haunted by a man who rocks in a chair on the porch. Up the block is a house that served as a stand-in prison when the city jail burnt down in 1910. Prisoners were put on the third level of the home, and conflicting stories say that one of these men either jumped out of the window in hopes of landing in a nearby oak tree but missed or was thrown out of the window after a fight broke out among some of the men. In any case, his ghost is said to still haunt the property. “We want streetscapes to remain intact so that they’re leafy and cozy and family-oriented,” Bourdier says. “We want the look of Lake Charles in 1900.” That said, the neighborhood is now much more colorful than it was at the turn of the 20th century. “In the early 1900s there was a trend in painting homes white,” he says. “This was a white town. All the buildings and all the houses were white – and then one lady who had a little two-story painted it a tangerine color with cream trim. Shock of all shocks, it took off like wildfire.” Color was soon in vogue, and today the streets are a rainbow of hues. At one point in time, one house had eight different colors on it (each shingle was individually painted) ranging from cream to dark purple with some blues. Those who live in this part of downtown are, for the most part, proud of their neighborhood. When someone wants to buy a home in the area, they’re told of the regulations and restrictions of maintaining the architectural integrity of the property. In Margaret Place (slightly southwest of downtown) in particular, homeowners are very protective of their neighborhood. “The neighbors will come over and say, ‘You can’t do that; it doesn’t look right,’” Bourdier says. Architecture in the downtown area specifically was greatly influenced by a massive fire that swept through on the afternoon of Saturday, April 23, 1910. The blaze began behind the unoccupied opera house, Gunn’s Bookstore and a soft drink stand and then quickly spread to the Catholic church and courthouse. When it was finally contained four hours later, many downtown Lake Charles businesses and buildings had been destroyed along with several homes. In all, the fire destroyed 109 buildings. The city wasted no time in rebuilding what had been lost, but it did so in a way that attempted to preserve the integrity of what Lake Charles once was; however, it’s also obvious that several of the buildings were designed by pattern book design, which means they have the same basic structure combined with personal touches. As a result of Lake Charles’ fiery history, visitors today have a fascinating smorgasbord of architecturally quirky buildings (many of which just turned 100 years old) that mirrors what once stood in and near downtown, as well as original architecture found immediately beyond the affected areas. During the annual Palm Sunday Tour of Homes, organized walking tours, special exhibits and interior tours offer a rare, in-depth glimpse at homes that defined this period of history. Over the holiday season, many of the homes are beautifully decorated with lights, and occasionally guided tours are made available in order to enjoy the festive façades. Public buildings on the walking tour have well-documented stories that make them significant in Lake Charles’ history. A New Orleans architectural firm, Favrot and Livaudais, practiced historicism, which means it copied building styles from other eras in history, and the firm’s hand in constructing a number of the buildings in the downtown area is obvious.